Legislation allowing the city to curb deadly driving through the use of speed enforcement cameras will soon resurface in Albany. A bill introduced last year called for a pilot program of 40 cameras, to be installed at crash-prone city intersections. Photographs would be taken of license plates (not of drivers), and tickets issued to vehicle owners. Tickets would not result in license points and could be contested in court. The bill included a five-year sunset provision. A spokesperson for Manhattan Assembly Member Deborah Glick, sponsor of the original bill, told Streetsblog a draft is now being prepared for the current session. Five resolutions in support of using speed cameras in NYC have already passed full community boards — in Manhattan, Community Board 2, 4, and 7; in Staten Island Community Board 2; and in Brooklyn Community Board 7. Many other community boards are in the process of showing their support. The transportation committees of Staten Island’s Community Board 1, Manhattan Community Boards 11 and 12, Bronx Community Board 4 and Queens Community Board 8 will be presenting resolutions to their full boards at their next meetings. Speed cameras have the endorsement of NYPD, NYC DOT, and the city’s Department of Health. And with good reason. 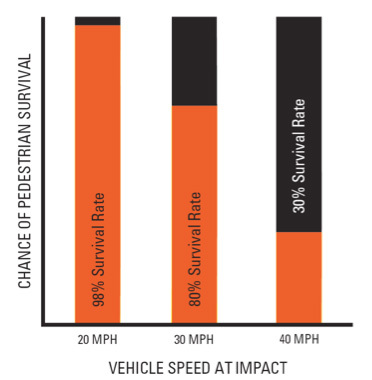 Speeding-related crashes killed 71 people in New York City in 2009, and injured 3,739. Not only have cameras have proven to be a potent deterrent — reducing the number of drivers speeding by 10+ mph by up to 88 percent, according to the Insurance Institute for Highway Safety — they offer a cost-effective means of enforcing the law, and allow police departments to direct manpower to other crimes. Manhattan’s Tom Duane sponsored last year’s Senate version of the speed camera bill. He could not be reached for comment as of this writing. Bollards are cheaper, and they don’t collect any dada. But this is a good thing,. Are speed cameras fast enough to catch motorcyclists as they do their 60mph-plus spurts? Pleas don’t limit them to NYC. The suburbs and other New York State cities need speed cameras too! Absolute nonsense. The City of NY only cares about revenue. An after-the-fact / ticket-in-the mail isn’t going to protect anyone. Amazing how STUPID the people of today are who think that losing their freedom will bring them safety. Etal, does that mean that you think speed cameras won’t reduce speeding, or does it mean that you think reducing speeding won’t protect anyone? Let me know. which is akin to cyberbanking prescriptions or e-prescribing at the ambulant physician setting. threats on our roads: speeding drivers. I would love to have such cameras on all roads because careless drivers are afraid of them and maybe this fear can force them respect the law. The freshman State Senator is carrying Assembly Member Deborah Glick's previously passed legislation — but this time, passage is likely in the Senate, setting up a conflict with the governor.